Small group meetings usually are a good chance to discuss, in a small circle of people, Bible truths, share different experiences, to get to know each other closer, and to apply the learnt things in life. This is a chance Wings for Wheels wants to offer also to people with mobility difficulties. For the present, the idea of small group is not carried out as well as we’d like it. It’s due to some circumstances that usually do not show up when it comes to „typical” Christian small groups. 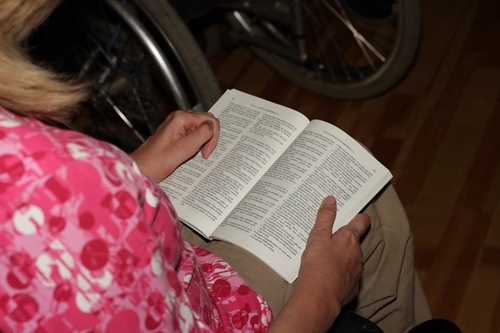 When we started small groups for people with mobility difficulties at the beginning of our ministry, we found out pretty soon that, without these three reconditions, the attendance of the group becomes irregular, unpredictable or impossible. There are not many of people having physical disability able to get to small group independently: most of them need a help of assistant to get him/her ready for going out, and a person who can take him/her by car to the meeting place and back home. This point should be taken into account when it comes participating of a disabled person to a church small group, and this is a situation still requiring a proper solution in W4W ministry. Currently, our small group meetings take place occasionally. While we still have not got all preconditions needed to organize regular small group meetings, we work with people individually. Those interested to know more about Christianity can receive some Bible lessons on their e-mails.